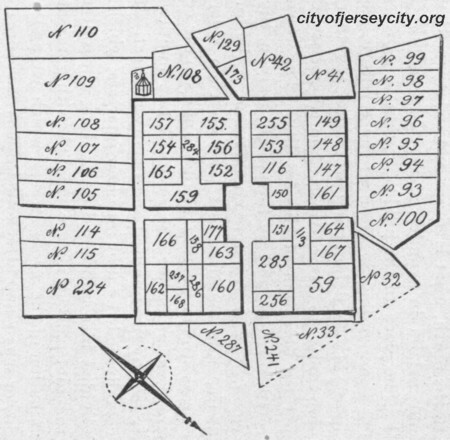 Jersey City History - Old Bergen - Chapter XIII. As a result of this order, several petitions were submitted "to settle on the maize land behind Communipau," and on the 16th of August, 1660, "several inhabitants of this province" petitioned for the right to cultivate farms and plantations on the west side of the river, behind Communipau, and to make there a village, or concentration. This was granted, "provided that such village shall be founded and placed on a convenient spot that may be defended with ease, and to be selected by the Director General, and Council, or Commissioners." This grant was, however, on condition that all who applied should share with others by lot, should send at least one person capable of bearing arms, for general service, and should make a beginning to erect buildings six weeks after the drawing of lots. We, underwritten, the late Director General and Council of New Netherlands, hereby certify and declare that in the year one thousand six hundred and sixty-one, by us underwritten, in quality as aforesaid, was given and granted to the inhabitants of the Village of Bergen, the lands with the meadows thereunto annexed, situated on the west side of the North River, in Pavonia, in the same manner, as the same was by us underwritten, purchased of the Indians, and as the same was to us delivered by the said Indians, pursuant to an instrument of sale, and delivery thereof, being under date of the 3rd of January, A.D. 1658, with this express condition, and promise, that the aforesaid inhabitants of the before named village, shall not be prejudiced in their outdrift, by means of any private collective dwellings (saving only the right of the then already cultivated farms at Gemoenepau), but that all such, who have any lands, within the district of the before named village, and especially at Pemrepogh and Mingackgue, all such owners shall be obliged to remove their dwellings, and place them in the village or town of Bergen, or by or about the neighborhood of Gemoenepau before named. Conditioned, however, that the aforesaid owners (in case they should desire the same) should be permitted to share, and divide with the inhabitants, of the before named village, or town, in the common lands of the said town, and in the place, and stead of their lands, lying at Pemrepogh and Mingackgue before named (and especially that the meadows lying near the village or town of Bergen, where the same begins, at the west side along the Kill von Kull should be, and belong to, and for the use of, the before named inhabitants of Bergen). And further, we the underwritten, certify and declare, that Michael Jansen, deceased (before or about the time that the aforesaid village or town was laid out), for himself as also for, and in behalf of, his brother-in-law, Nicholas Jansen Barker, did, in our presence, renounce all the right they had to the pasture ground, laying behind Gemoenepau, for a common outdrift and pasture between the aforesaid village or town,and the neighborhood of Gemoenepau before named. And lastly, that no more lands were given or granted to Dirck Clausen than Rightpocques, with the meadows thereunto belonging, as by the ground brief thereof may further appear. The commanding position of the territory, making it capable of easy defence and protection, together with its proximity to New Amsterdam, doubtless determined the selection of this locality. The town was directed to be laid out by Jacques Cortelyou, the first surveyor of New Amsterdam. It was in the form of a square, eight hundred feet long on each side, with two cross streets meeting at right angles in the center, where a vacant space was reserved, one hundred and sixty feet by two hundred and twenty-five feet. These streets divided the plot into four quarters, which were subdivided into building lots. Along the outer side of the plot palisades were erected, with gates at the termination of the cross streets, which were closed at night, or when any attack of Indians was threatened. The original plan is still preserved at Bergen Square, Academy Street and Bergen Avenue being the intersecting cross streets, while Tuers and Idaho Avenues on the east and west, and Newkirk and Vroom Streets on the north and south, mark the line of the palisades. The houses of the settlers were erected within the enclosure, in accordance with the condition of the grant of the Council, for their better protection against Indian attacks ; while their farms extended out into the adjoining country. These were called buytentuyn, or outside gardens. They were thoroughly cultivated, and in part used for grazing, and the cattle were driven within the palisades nightly, or when the savages became unusually active. On such occasions, water was obtained at great risk, and much suffering was caused. Whereupon the Schout and Schepens ordained, that a well for the public accommodation be constructed within the enclosure. This action was ratified by the Council at New Amsterdam, February 9, 1662, and a well was dug in the center of the square, a long sweep erected for raising the water, and troughs placed about it from which the cattle might drink. This well was used for a long tune, but was finally filled up and covered over. During the war of 1812, a Liberty Pole was erected in it. This pole was surmounted by a gilded star, which, flashing in the sunlight from its prominent position, was visible from a long distance. 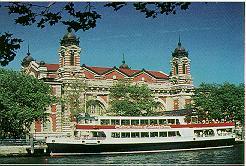 It became a landmark especially for wary fishermen to locate the favorite haunts of the finny tribe in the waters of New York and Newark Bays. Their custom was to run an imaginary line from it to some prominent object on the opposite shore, which was crossed at the spot sought for by a similar line at right angles. This pole was taken down in 1870, when the car tracks were laid. As the square still retains its original size and shape, the exact location of the old well can be approximated, as it was dug in its center. A curious document dated April 1, 1661, sets forth the lease of a lot, conditioning the construction of a house thirty feet long, and barn fifty feet long, to be built along the palisades of the village. The lessor to deliver in March, a plow and wagon for joint use; also on halves, two young cows, and two three-year-old oxen, on half risk; and the following spring, two more of each. The occupant to pay the first and second years, fifteen pounds of butter for each cow, and for the remaining four years of the term, two hundred guilders, in coin or good wampum.